The Numbers! 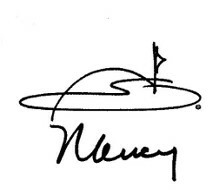 -- These numbers are "old" numbers -- just for the U.S. and over a decade ago and used for the book I wrote "Women Welcome Here" for the National Golf Foundation. So why look at these? First, it shows that over the past decade the growth in the number of women golfers has consistently increased almost year over year. It also shows that consistently women golfers represent just one out of five golfers in the U.S. That means that women must be more insistent that golf facilities (which are almost always managed by men) pay more attention to women's and girl's golf. Please read "Advice to Women Golfers" in the "Articles" tab on the left. And I also keep these numbers for those doing research in the growth of women's golf in the United States. I receive many calls from college students majoring in sports marketing and golf about these statistics -- they are hard to find except on my website. Women represent one-quarter of adult golfers in the U.S.
Women' golfers (age 18 and older) increase 2004 over 2003 and now represent 25.3% of all golfers -- primarily attributable to the increase in occasional golfers (7 or less rounds/year). 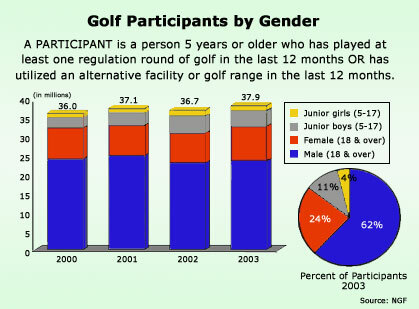 Men golfers (age 18 and older) decreased 2004 over 2003 and men now represent 74.6% of all golfers. •About 6% of the total number of women 18 and older (110 million) in the U.S. are golfers. The potential market is huge. •An additional 2 million women use alternative facilities such as par-3 courses and practice ranges. •About half of ALL women golfers play less than six rounds per year. 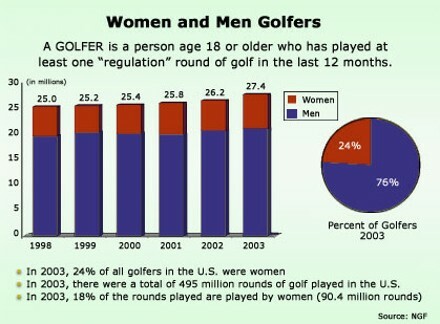 •The average number of rounds per year by women golfers is about 18. 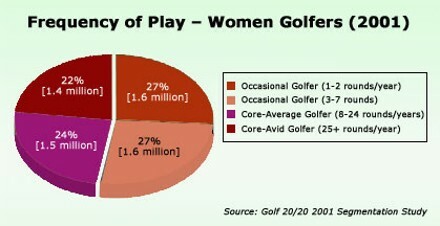 Avid women players who play 60 rounds/year skew the average to the high end. •52% of former women golfers quit because they didn’t have time. •38% of former women golfers quit because of family obligations. •25% of former women golfers had trouble finding someone to play with. •47% of women golfers were introduced to golf by a family member (compared to 22% for men). •23% of women golfers were introduced to golf by a friend (compared to 31% for men). •The average score of women golfers is 108, compared to 96 for men. • 35% of Occasional women golfers score over 120. • 19% of Core women golfers score over 120. • 9% of Avid women golfers score over 120. •56% of women golfers work full-time. • 16% of women golfers work part-time. • 28% of women golfers have kids at home. •Women golfers come to golf older than men and stay longer. •The median age of AVID women golfers is 56. • 37% of women golfers are fifty or older, compared to 32% for men. •In July 2003, over 15,000 girls participated in the fourth annual NGCOA Take Your Daughter to the Course Week. In 2004, participation was significantly higher! • In 2002, 36% (37,000 girls and young women) of the total 103,000 participants in The First Tee programs were female. In The First Tee Northeast Region, 47% were female. For more information about any of The Numbers!, contact Nancy using the FREE HELP LINE tab. 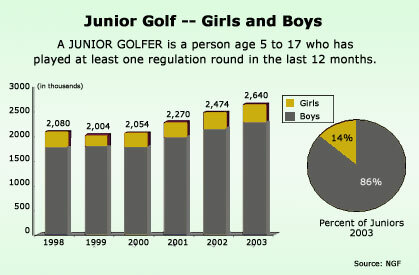 The charts below will be revised to reflect recently released (6/2/05) information from the National Golf Foundation.